JAY: So it seems rather clear. International law says, one, illegal war–in fact, I think it’s in that charter, I believe, is the language which more or less says wars of aggression are the highest war crime, highest crime against humanity. The war in Iraq was illegal, according to most legal scholars I’ve heard, including Kofi Annan, who, unfortunately, didn’t really come out and say it until after he left United Nations, but he said it. An illegal war, invading a country is a war crime. 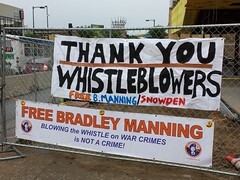 If Bradley Manning sees atrocities committed in the course of a war crime, it’s not just some choice he made. It’s not just a moral obligation. Under international law, he actually had a legal obligation, and certainly a defense, for doing what he did. So talk a bit about, you know, the significance of Nuremberg, a bit about Manning, and then we’re going to get into, you know, where is international law anyway. PRASHAD: Well, look, the first thing to say is that it is true that on August 8, 1945, this Nuremberg Charter appears. It is signed by the major powers. It has the weight of international authority. And it suggests that if you observe something that is a war crime, you are under a legal obligation to report it. That is, you know, unassailable. It is a fact. JAY: ‘Cause they won’t accept that the war is illegal. They won’t accept there’s war crimes. And then it just becomes this abstract thing, can a soldier reveal secrets. PRASHAD: Exactly. This is not about a soldier revealing secrets. This is about a soldier seeing that something to his mind illegal and also immoral had happened, the chain of command had lied or covered it up, and he felt therefore legally and morally obliged to do something about it. And I think we need to salute him for that. This entry was posted in All Posts News Politics and-or Videos, Dandelion Salad Videos, Human Rights, Iraq on Dandelion Salad, Politics, War Crimes and tagged Chelsea Manning, Human Rights on Dandelion Salad, Iraq War Documents from WikiLeaks, Manning-Bradley, Nuremberg, Vijay Prashad, WikiLeaks. Bookmark the permalink. It is painfully obvious that the US hoodlum gangster state is guilty. This fraudulent Washington set up is not only in contempt of the Nuremberg principles, it is in breach of international law, and moreover it refuses to be a signatory to the ICC. The simple reason is that as an international felon it dare not risk indictment.. The United States is a global pariah. It is a Nazi tyranny. It must be abased.